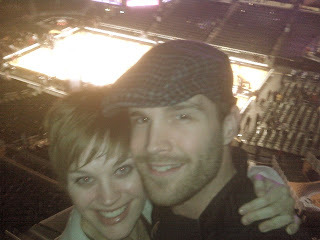 after the Lakers won - we were happy! Alright, that's all I've got in me for now. Will post more later! What the hell is WRONG with healthcare in this country??? I know I'm not the first person to ask this question, but it's on my mind a lot lately. I went to the local Planned Parenthood (oh what a delight!) yesterday to get my annual exam and birth control, and they treated me like crap, like a street urchin. I actually left because I couldn't possibly imagine feeling that angry and uncomfortable and allowing one of their nurses (a NURSE, not a doctor. I know nurses have training too, but I would like a doctor, with a medical license, to look at me.) to examine me. I understand that those kind of places have all kinds of girls and women walking in, and I understand that working there would get some people kind of jaded and even a little judgmental. But if that's the kind of person you are, then QUIT. There are plenty of unemployed people in LA County who would joyfully do your job and provide quality service and care to people who cannot afford healthcare. I don't appreciate being treated like I don't matter and like I am some sort of low-life just because I happen to not have a job right now and am struggling financially. I probably have a hell of a lot more class than the bitter b*tches who work there. That's not really fair to call them that. I know not all of them are like that, but I'm mad. And another thing, what is the point of making an appointment if I have to wait TWO hours to be seen?? TWO HOURS. In a overheated, tiny, packed room. With not even a single magazine!! It's depressing. And, on top of that, I can't go to Planned Parenthood or a clinic for all of my healthcare needs. Free health care only seems to be attainable in clinics if you need emergency care or if you're looking to get birth control and an annual pap. So today, I was online looking up health insurance plans for me and my boyfriend, just to know what we're in store for when more money starts, hopefully, coming in and we can afford some coverage. HOLY CRAP! You pay almost $300 a month and then you have to pay a deductible and then you have to pay a CO-PAY and sometimes 30% "co-insurance." What?!?! Why am I paying monthly? Where is that money going? If we're paying almost $300 a month, then why do we have to spend all this other money too? There is something severely wrong with our system. So THEN, I looked up Medi-Cal. I mean I seriously cannot afford health insurance. I don't foresee a time in the near future when we'll have that kind of money, so there's gotta be some kind of option for us, right?? An option between paying thousands of dollars to take care of our bodies and paying nothing to be treated like crap and given sub-standard care (trust me from experience - I have been misdiagnosed AND manhandled in clinics: don't worry; I reported him). Nope. No Medi-Cal either. I don't have a baby. I'm not blind or disabled. I'm not a refugee. And I'm not pregnant. So apparently, MY body doesn't need to be taken care of. What am I supposed to do? What is Levi supposed to do? I have terrible vision and can't use glasses. I have to wear contacts because of my neck. Levi has scoliosis and works 40 hours a week on his feet. His back ALWAYS hurts. Do you think the clinic is going to take care of our problems? Nope. Do you think Levi even has time to wait two hours in a clinic if he needs to see a doctor? Nope. It just feels wrong. It seems like there should be some sort of option for us besides never going to the doctor. It seems like going to a clean, legitimate doctor's office, without having to wait two hours, to have a sore throat checked out or an eye infection treated shouldn't be a LUXURY. I don't know. Maybe we should just move to England or Canada, where the government values the health of their people. The United States is supposed to be a country where ANYONE can make it. Rags to riches and all that. How can you go from rags to riches if you don't even have your health to support you? How is anyone supposed to get ahead in this place? It just doesn't seem possible in a system that doesn't value all of its citizens. One of the things I have missed most since my entrance into poverty is going out to eat. 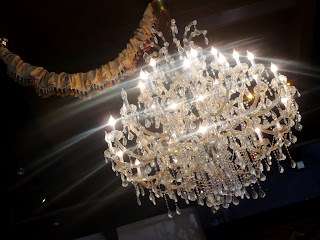 I love good food, and I LOVE restaurants. It's something I've enjoyed since I was a little girl. Don't get me wrong. I enjoy a homecooked meal too, but there is just something so special and celebratory about eating a meal and drinking a glass of wine in a restaurant. It's extravagant. 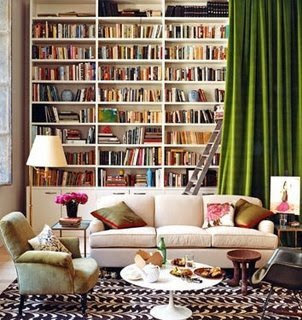 It's frivolous and luxurious. And I love it. Especially since moving to Long Beach. There are so many amazing, locally owned restaurants here. I love supporting business owners within my community and patronizing a business to the point where the owners and other regulars know you by name. There's something so community building about it. That's probably my favorite thing about Long Beach - the community spirit and abundance of locally owned, non-corporate, non-chain businesses. It's something that I've been pretty bummed about missing out on for the last few months. In order to not feel like we're completely missing out on life and the things we love, Levi and I have figured out a few ways to get our restaurant fix (he loves eating out as much as I do) without completely going outside of our budget. The best way to do this is to split entrees. Unfortunately, Levi has the world's fastest metabolism and the huge appetite that comes with it, so this can be difficult sometimes. We've found a couple different places that have menu items that are large enough and rich enough to satisfy Levi's appetite and both of our tastes. 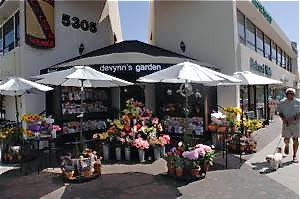 We had the most delicious lunch at a little place in Belmont Shore today. 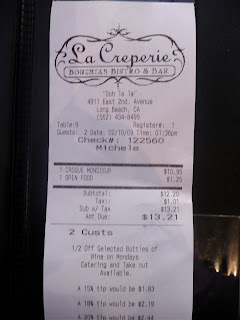 The restaurant is called La Creperie. I borrowed this one from someone's flickr. 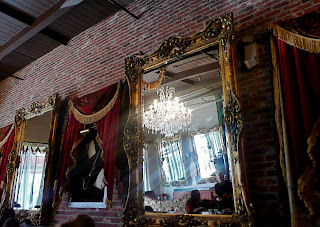 I love the contrast between the gilt framed mirrors and the brick wall. 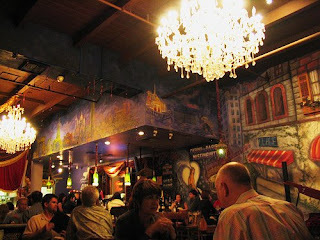 It's a yummy little bohemian, French bistro specializing in its namesake - crepes! La Creperie is actually pretty special to us - it's the place where our friendship went from just friends to something more while splitting a bottle of Pinot Noir and our favorite crepe. 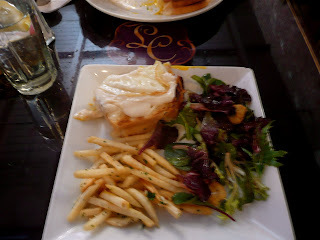 Today we shared the Croque Madame. Mmmmm. It's a sandwich layered with French bread and turkey (it's supposed to use ham, but we substitute turkey because I prefer it), covered with bechamel sauce, and topped with an over easy egg (take off the egg, and you've got yourself a Croque Monsieur). It's very very rich and very very delicious. La Creperie serves theirs with a side of garlic and parsely French fries and a mixed greens salad. Look at how large my half of the serving is! I can't imagine eating the whole thing...especially for lunch. I'd explode! After lunch, we walked around 2nd street and popped into a couple of interesting shops just to browse, read some magazines at Devynn's Garden (an outdoor magazine/flower shop whose shopkeepers never seem to get annoyed if you don't buy anything), and then scored free traditional cappucinos at Peet's, our preferred coffee retailer. It was such a nice day. And it only cost us $13.21 plus tip! We'll have to skimp on our dinner tonight to make up for it, but it's not too bad for the couple with no disposable income! I just saw the 2002 film Secretary, starring Maggie Gyllenhaal and James Spader, for the first time last night. Ohmigosh. SO GOOD! The majority of the movie is just flat out quirky and over the top. I was kind of watching it, wondering where it was going and how on earth the sexual tension between Maggie's and James' characters would ever be resolved. I was totally amused and entertained, but I didn't see the point of the story until the last third. I didn't know how sweet it would turn out to be. I love that a movie about a dominant-submissive relationship could turn out to be such a great love story. I am so intrigued by looking at things from different perspectives. It's something I've been seeking out a little bit more and noticing more lately, whether it's in art, film, music, the news, whatever. 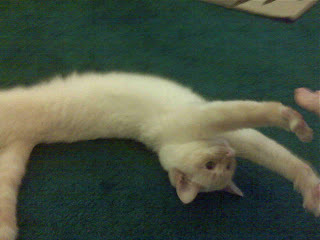 I feel like it really stretches and enriches my brain. It gives me so much more empathy and understanding. I really believe that the more ways you're able to look at an experience, person, or situation, the closer to "truth" you are. This was actually our first Netflix DVD. Ohhhh how I love Netflix! Levi and I are always looking for ways to entertain ourselves either for free or cheaply since we don't have any disposable income. Being poor can get really boring! It turns out that we're actually saving money by signing up for Netflix. We signed up for the unlimited rentals where you can take two DVDs out at a time. It's $13.99 a month, which is less money than we were spending at Blockbuster every month. And with Netflix, we get to see way more movies. AND the selection is sooooo much better. Just like many bloggers before me, I'm not exactly sure what I will be doing here or how often I will be doing it. 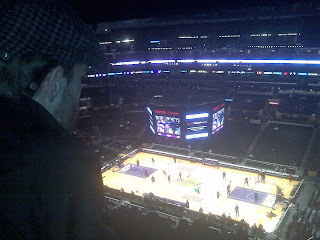 But I thoroughly enjoy quite a few blogs on a daily basis so I thought I would contribute my own. Now for some explanation of my blog's title. Without getting too political, the recession our country is currently experiencing bloooooows. I have found myself in some pretty dire straits financially, and I'd like to chronicle my experiences so that one day, when I am sitting in the lap of luxury, I can look back and remember all the hard times and amazing times that being poor brought me. My boyfriend, Levi, and I live together with the lovely Lily in a teeny tiny studio, with the ugliest emerald green carpet you'll ever see, in downtown Long Beach, California. I am convinced that the Bob Marley song Is This Love was pretty much written for us. I was going to school 40 hours a week (getting my Esthetician's license) when the recession really started picking up. I had saved a big chunk of cash in order to pursue this goal. It would have been just enough to get me through, but a few things happened along the way. To make a long story short, I ran out of money in October, and Levi has been supporting us both ever since. Levi works as a hairstylist, and let me tell you - he's amazing! He doesn't make tons of money (no commission - blah), so most months we juuuusssst squeak by. I have expanded my job search to anything due to the lack of open positions in the salon industry, but, so far, nothing has panned out. Jobs go really quickly around here. The unemployment rate in Los Angeles County is 9.9% so the competition is fierce. So for now, I try to stay busy and take care of Levi and our home the best I can (speaking of, I really should be doing laundry right now). Despite less than desirable circumstances, I love my life. I'm even grateful for the financial hardships we struggle through. They've taught me to stress less and to appreciate everything I have.